In the same way Rudolph is synonymous with Christmas, the Bunny is the most honoured symbol of Easter. But while we all observe the tradition, have we ever stopped to ask why? Obscure as it might seem, the association of rabbits and eggs with Easter actually has some founding in logic. Spring has long been considered the season of rebirth and renewal, when nature reclaims the landscape depleted by months of winter and new life emerges and thrives. With this in mind, having a rabbit or hare (as it traditionally was) as the symbol of the season makes sense considering what prolific breeders they are. What better animal to represent the fertility of springtime than the rabbit? Similarly, eggs symbolise the promise of new life and the anticipation of a coming event. As far as religious symbolism goes, the egg represents Christ’s resurrection from the tomb (illustrated by its hard shell) and life materialising from within. Some stories suggest that Mary Magdalene was carrying a basket of eggs at the time she discovered Jesus’ empty tomb. On realising His resurrection, her eggs supposedly turned blood red, symbolising God’s sacrifice. This might account for the ancient custom of painting and decorating eggs around Easter time, with the colour green also being used to reflect new life and nature. Going back to the Easter Bunny, yes, it’s the obvious symbol of fertility and procreation, but who decided to bring animals into the Easter tradition? Many people credit the German pagans for this, who first began mentioning the hare in their celebrations of Eostre (the goddess of dawn, spring and fertility) during the 13th century. Unsurprisingly, Eostre’s earthly symbol was the rabbit, and because of age-old associations with eggs and fertility, she was also closely linked to the egg. Because the pagan celebrations of Eostre and the start of spring coincided with Christian festivals commemorating Christ’s resurrection (on the Spring Equinox), the two ceremonies became one, with Eostre’s symbol of the rabbit passing to the Christians along with the name ‘Easter.’ Both the rabbit and the egg therefore became popular motifs of the season. The Germans originally portrayed the hare or Oschter Haws as a symbol of judgement, determining which children had behaved well enough to receive the gift of eggs. The hare would carry a basket of colourful eggs and dispense them to deserving children the night before Easter Sunday, a bit like Father Christmas on Christmas Eve. On occasions, the Oschter Haws would hide the eggs for children to find, which is probably what began the Easter egg hunt tradition. The Easter Bunny was probably brought to America during the 1700s alongside German immigrants where it has since evolved, with ideas about rabbits laying ornate eggs of the chocolate variety being a figment of popular culture. Although not all Christians fully embrace the concept and symbolism of the Easter Bunny, the tradition of associating rabbits and eggs with Easter is rooted in antiquity and is never likely to lose favour. 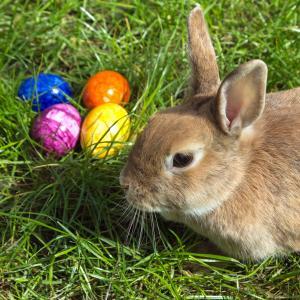 Recently, the suggestion was made that invasive species like the rabbit should not be seasonally celebrated. In light of this, Australia took a novel approach to the Eastertide association with rabbits, by promoting the endangered Bilby instead. The Bilby is a native, desert-dwelling marsupial whose numbers are so low that the Australian government decided to popularise it as an alternative to the traditional bunny rabbit, selling chocolate-shaped Bilbies with a percentage of the profits going towards conservation efforts and research. At first glance, the Bilby might just pass as a rabbit, but regardless, the sentiment behind the change is admirable.